Able to grow under a wide range of water conditions, this plant is one of the hardier specimens available to the hobby. 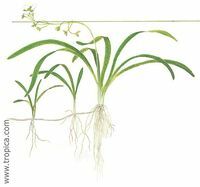 As Dwarf Sag grows, runners will be sent out from the adult plant to start new stalks. Reproduction is accomplished very quickly through the use of runners. Sagittaria can also flower and reproduce by seed. The higher the lighting, the faster this plant will grow. This plant is native to S.E. USA, South and Central America and is a member of the Water Plantain Family. This plant looks grassy, but the leaves are quite spaced out. It does well in a wide variety of light from low to high. It is an easy going plant that will work well for all ranges of aquaria person. It will grow slowly and steadily in low light and does not require CO2 injection, but it wouldn't mind it either. This plant does sometimes grow very tall, and has been known to go back to its original small size if moved to the back of the tank. This page was last edited on 22 August 2011, at 12:41.